Size: X-Small (4-6), Color: Purple/Green is currently out of stock! Includes: mermaid style dress with purple lurex top attached pink sequin bra turquoise lurex and sequin tail and pink seashell headband. Does not include seaweed boa. **Please Note: Dress has an opening at the bottom. Package states hair clips included, no hair clips included only headband. 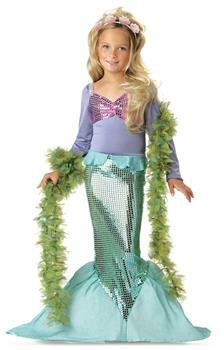 Bring sparkly, magical and dazzling fun to your costume party with enchanting mermaid costume. If you want to dress up in eye catching outfit and express yourself like a fairytale character then mermaid attire will work best for you. Dive into sea mysteries and unfold many secrets with beautiful mermaid costume. Memories are always kept for lifelong time and special ocassions come for capturing these memories. Are you planning to gift her a party dress which she wants so badly? If you are looking for a classic and gorgrous costume than choose Lil' Mermaid Toddler / Child costume.